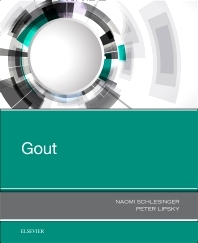 Concise and clinically focused, Gout, by Drs. Naomi Schlesinger and Peter E. Lipsky, provides a one-stop overview of recent developments regarding this common form of inflammatory arthritis. Impacting an estimated 8.3 million people in the U.S. alone, gout is seen frequently by both primary care physicians as well as rheumatologists. This resource provides detailed coverage of the epidemiology, causes, diagnosis, management, and treatment of patients with both acute and chronic gout. Addresses key topics such as genetics, hyperuricemia, comorbidities of gout, treatment guidelines for acute and chronic gout, classification and diagnosis, and imaging. Discusses future outlooks for improving pharmacological and nonpharmacological treatment options, including an overview of drugs in the pipeline.